Scott has been involved in the entertainment industry for over 15 years both in Australia and the UK and in 2002, he founded 'SoundStorm Entertainment' which is now one of Australia's most reputable entertainment companies. 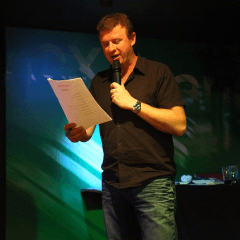 Scott's experience covers a wide variety of roles including MC work, TV & Radio & event organisation and with an up-to-date industry knowledge and a vast network of contacts in music, sport, T.V. and hospitality, Scott is a trusted name in the entertainment industry.